What Is Digital Art Worth? Fine art, unlike other media industries, pushes prices this high in part because of the perceived rarity and unique, unquantifiable quality of each individual work. Music, film, and publishing have been forced to adapt as their products became more numerous and often instantly accessible. For many, that’s meant making the physical experience of the work more valuable, from 3D movie premieres to limited-edition vinyl pressings. But art, grounded as it is in the practice of paying vast sums for a single irreplaceable object, never faced quite the same challenge. So it can be difficult to market artwork that’s impossible to really own, in the “hanging an original Picasso in your antechamber” sense. It’s a good — and timely — question: just what is a digital artwork worth? Or, more broadly: where do digital works sit on the spectrum of art? I’m part of a group show next week, and one of my pieces — a collaboration with Joel Farris, Jack Michielsen, and Teresa Tam — seeks to explore this. It’s called This is for you, when it loads. (punctuation and capitalization as intended). Each of us typed a phrase relating to our practice into Google and captured a screenshot of the autocomplete suggestions, which — to some extent — reflect the broader public’s view of the content of each of our practices. My contribution to the collaborative piece This is for you, when it loads. 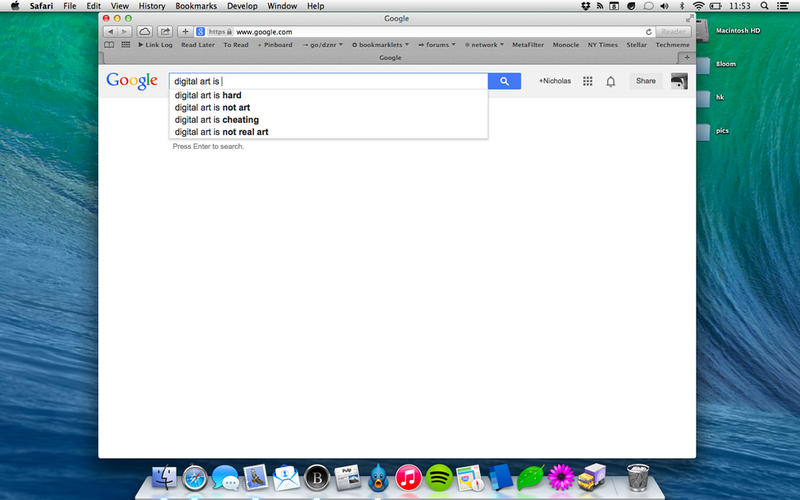 According to Google’s suggestions, digital art is “hard”, “not art”, “cheating”, and “not real art”. I’d add one more to that: “nearly impossible to sell”. I’m not talking specifically about this piece, but digital art in general. It’s the same challenge photography faced in its earliest hundred or so years, and I don’t see the public’s perception of digital artworks changing much in the near future.